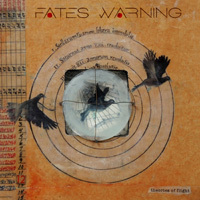 Fates Warning. The name is synonymous with American progressive metal. Having made somewhat of a resurrection in 2013, the band returns with their twelfth album, the second in three years, Theories Of Flight. But the album finds the band down to a four-piece with guitarist Frank Aresti not involved in the recording. As you might have read elsewhere, Fates Warning isn't exactly my go-to band for American progressive metal. It's not for the lack of creativity. Guitarist and main composer Jim Matheos continues to offer varied, sometimes complex, arrangements, and Ray Alder is an honest and emotional lyricist. The reason is for the often dark and melancholy tone of the music and lyrics. And some of that is retained in this album. Yet listening through this album, there seems to be a greater liveliness lingering among the moodiness. From The Rooftops and The Light And Shade Of Things definitely have their uplifting moments. Then there's Seven Stars, an immensely catchy number where Matheos seems to have connected with muses of rock groove and AOR accessibility. I don't think the song is prog at all. Moreover some of that accessibility returns with White Flag and Like Stars Our Eyes Have Seen. There's some big groove underneath each and Matheos riffs churn right with that groove. The larger song The Ghosts Of Home is another brisk, breathtaking workout, with the guitar line leading, but only because it's being chased by Bobby Jarzombek's equally brisk and groovy drum line. Having said these things, I'm still not sure I'm a true believer, but I also didn't come away feeling that I needed a shot of happy joyfulness pumped into a major artery. Otherwise, I think the diehard fan will find Theories Of Flight consistent with Fates Warning's creativity and formidable back catalog. Is it another Parallels or Awaken The Guardian? Perhaps not, but likeable, nonetheless. I think the diehard fan will find Theories Of Flight consistent with Fates Warning's creativity and formidable back catalog.